One of the richer concepts developed by Lee is an economy of Reputation; one’s Name is carefully monitored by gossip sheets and, once a person comes of age, may be publicly traded. Here, one might think also of Cory Doctorow’s “Whuffie,” a kind of social capital that replaces money in a post-scarcity economy, except that it is closer to our own more familiar daily rise and fall of celebrity stardom. Students were especially appreciative of a Reputation Exchange, since it both connected to their own whimsical identification with this or that star of the week, and because it got them thinking about precisely the relationship of their own public self to their inner self. I asked Lee about the process of writing the novel, with an eye towards the set of ideas that structure it and that provide the contours of Lee’s growing critical work (his post-doctoral work is apparently coming together as Countercultural Capital: The Politics of Irony and Postwar Fiction, and he is also the co-editor of a forthcoming book called The Legacy of David Foster Wallace: Critical and Creative Assessments, to be published by the University of Iowa Press in 2011). The answer I received – and which I seem to receive from nearly every writer of “novels of ideas” – is that he imagined the story and its character(s) first. As a non-writer, I tend to believe that a set of philosophical (or other) ideas provide the seed from which a writer works, probably because I am so constantly unraveling interesting narrative works to reveal the core of ideas that rest beneath the surface of character, or effects, or emotion (which explains why, for instance, Chuck Palahniuk is nearly useless in my courses, but Charlie Kaufman and Christopher Nolan are crucial). 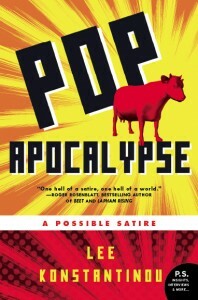 And so while Lee’s own vision of a literature of ideas, from Pynchon and Wallace to Gibson and Shakar, clearly shows through, Pop Apocalypse is in the end a well-sustained, humorous, and at times terrifying satire on our current near-apocalyptic culture and politics, and an awesome critique of celebrity personae. Lee also commented on one of my Infinite Jest posts, Post-Ironic Sentiment, and you can see our exchange there. * As a last note: I just came across a mention of Google Goggles, the first I.D. search engine based on photos you take from a mobile phone. Apparently, they eliminated facial-recognition software fro the project, just now out of beta-testing, but it’s hard to see how or why it would be permanently excluded. Congrats, Lee, on beating Google to the punch, if barely. Thanks for the expanded review, Jeffrey! I appreciate your thoughtful response. It is interesting to reflect on how ideas get into fiction. One of the strangest complaints I encountered in reviews of “Pop Apocalypse” was that there were “too many ideas” in the novel. While writing “Pop Apocalypse,” I was never conscious of a strong separation between the plot, characters, and ideas (or, as I think of it, the world) of the book. I am not exaggerating when I say that the whole book — Eliot, his world, his story — came to me almost fully formed. Eliot seemed perfectly made for the world of total celebrity surveillance; the novel’s plot of “identity theft” arose organically from the clash of Eliot and the video search systems that govern his world. The neo-neoconservative politics of Eliot’s father, and the relationship between the national security state and the celebrity economy, seemed absolutely necessary. To what other possible uses would we put a system of perfect video surveillance? A friend once commented that Eliot is a sort of pinball in an elaborate machine, and his — perhaps impossible task — is to start to assert something like moral control of his own life and actions, starting with the first line of the book. That seems about right to me.